After breakfast, depart for Kompong Chhnang on an excellent asphalt road. Visit of Udong, the ancient Cambodian capital between 1618 and 1866. Visit by motor canoe of the floating village in Kompong LUONG (on Tonle Lake). More than 4000 inhabitants, mainly fishermen of Vietnamese and Cambodian origins, coexist in this village. This small town is home to a bustling port as it is located at the mouth of Tonle Lake and the Tonle River that leads to Phnom Penh. Visit of its old French quarter with its pretty parks and its beautiful colonial buildings. Lunch at Kompong Chhnang in a Cambodian restaurant. The road to the port is lined with houses on stilts. Kompong Chhnang owes its name to potteries (potteries = Chhnang) which are made in the region and sold throughout Cambodia and its location on the Tonle Sap (Kompong = port). Then, departure for the visits of the neighboring village of Oudom Russei where are and his traditional pottery workshop Opportunity of a short walk in the Cambodian countryside, allowing you a first contact with the inhabitants of the countryside. to have direct contacts with the inhabitants of the countryside. Your chauffeur will serve you as an interpreter with them if need be ... If enough time a short journey in oxcart can be proposed Continuation of the road until Battambang and transfer to the hotel. Dinner free. Night at the hotel. Departure early in the morning to get to the pier where you take the boat that will take you through the meanders of the canals and then through the Tonle Sap to the pier of Siem Reap. Your luggage will be taken care of by our driver who will welcome you at the landing stage of Siem Reap. Picnic lunch on the boat. The boat trip is beautiful to admire the life of the locals on the shores (fishermen, farmers) and the many different birds and landscapes. From February to August, if the waters are too low, the transfer will be done by road including some visits such as the West Baray (large water reservoir of Angkor) and a visit of the Craftsmen of Angkor to Phouc, where you can admire the manufacture of silk fabrics. Transfer to the hotel in Siem Reap. After breakfast at the hotel, departure for a first day of visits to the temples of Angkor. Visit the main temples of Angkor: Angkor Thom with the South Gate, Bayon, Baphuon, the Terrace of Elephants, the King's Leper Terrace. Lunch on site in a Cambodian restaurant. In the afternoon, visit the largest temple, the splendid Angkor Wat. Sunset on Angkor Wat from Mount Bakend. Return to your hotel at the end of the afternoon. Then departure for a dinner show at the Khmer Theater of Siem Reap, the beautiful "Apsara Theater" where you will dine while admiring a magnificent show of Apsara dances (traditional Khmer dances). Depending on your form, visit the Siem Reap Night Market. Return to the hotel for the night. Early in the morning, you will explore Kravan and Banteay Srei. This jewel of Angkor surpasses the other existing temples in artistic terms. It is more of this place that the writer and art lover André Malraux reported in France ruins of pink sandstone borrows from this civilization. After lunch at the local restaurant near the site, you will continue a trail to the thousand lingas river. Visit a Khmer village with its palm sugar production and then discover the Ta Prohm temple, overgrown with lush vegetation. This is where you will see the massive trees growing on the walls of the temple. It is also the best place in Angkor to appreciate the grandeur of nature and the ancient civilization lost. Return to Siem Riep. Free dinner. Night at the hotel. After breakfast, departure to join Kompong Cham, a major city located in eastern Cambodia on the mythical river, the Mekong. Short stop at Kompong Kdei to admire the last Angkorian bridge, still in service after 1000 years. In Kompong Thom, a short 25km trip to visit the Sambor Preah Kuk temples, pre-Angkorian temples dating back to the 7th century. A hundred temples are scattered in the jungle. Sambor was the capital of the Chenla Kingdom. The most important are Prasat Sambor, Prasat Tao and Prasat Yeay Peau. Lunch at a local restaurant near Tonle Lake. Continue on the road towards Kompong Cham with a stop to Skuon where you can taste, if the heart tells you, the specialty of the area: roasted tarantulas. Arrival in Kompong Cham in the afternoon and transfer to the hotel located on the Mekong River. Dinner free. Overnight in Kompong Cham. Early morning, departure for Sen Monorom capital of the province of Mondolkiri (dirt tracks, about 4 hours of road depending on the condition of the road). This province is partly border with Vietnam, it is isolated and uninhabited and very interesting, covered with forests with many waterfalls. 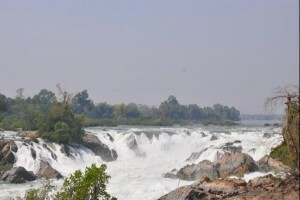 It is one of the highest inhabited points in Cambodia (plateau at an altitude of about 1000m) and cooler than Phnom Penh in summer, making it a warm-season resort for Cambodians (few Western tourists return to this region). The main ethnic group living in this region is the Phnong or Banong. Formerly nomadic population living in the forest and that the current authorities push to sedentarize, schooling the future generation in Cambodian schools or the language and the tribal traditions have no more place to be .. The Phnongs having no written language and their traditions are therefore oral .. It is a civilization in the process of extinction .... The habitat is traditionally bamboo, round structure, easy to dismount and up, thatched roof or live dozens of people. Overnight at Sen Monorom. A trek with an elephant can be on the program .. the provincial authorities consider illegal elephant rides. The trek is therefore with an elephant who goes to the forest in search of his lunch; During this time you will be able to enjoy your meal and when you return from the pachiderme you can take a bath in the river with him. Early in the morning, visit with the market guide of Banlung, a particular market or go every morning very early, the different ethnic groups (Kroeung, Tompuon, Jarai), to sell or exchange their products, vegetables, forest picking, game etc. These ethnic groups are very recognizable by the small round wicker basket that women wear on their backs or in front of them during the market. Then departure for a visit of the Province of Ratanakiri in 4 × 4 through the jungle. Arrival at a small pier and boarding one of the dugout canoes. Trip by canoe on the Se San River to visit the strange Totem cemetery of the Tampun Ethnicity fled into the jungle. Visit the village Tampoun. Picnic lunch. Then hike up the Se San River to the Chinese and Laotian villages along the river coast. Return to the hotel in Banlung late afternoon. Dinner free. Overnight in Banlung. Departure for Kraties about 4 hours journey with Lunch en route or on arrival. This time you will be staying in the city and will be able to visit the surroundings: The pagoda with 100 pillars, the turtle pagoda, take a walk in Kraties which is a city with old colonial buildings well renovated.